With every board company making a wooden wakeskate these days, one of the most frequent complaints from riders is that their boards are not lasting long enough. Let’s face it; wood and water don’t usually play well together. With that being said, some riders want nothing less than the feel of a wooden board under their feet. Others have moved to compression molded skates that will surely last longer, but fall short on many of the features that a wood skate offers. A few complaints that we have heard over and over about most of the compression molded skates on the market today is that they are very light weight, ride too high in the water like a wakeboard and have razor sharp edges. Taking all of this into consideration, Erich Schmaltz of Integrity Wake, took on the challenge of creating a wakeskate with the lifetime of a compression molded skate that has the ride of a wooden skate. After months of researching, testing and talking to riders on the Wakeskating.com message boards, Schmaltz has created a wakeskate like no other. The new Integrity wakeskate is in a league of its own. The Integrity Wakeskate is only available in one size at this time. 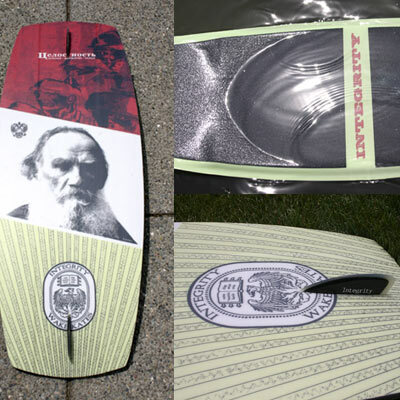 The board is 41 inches long, 15.85 inches wide in the waist and 11.15 inches wide on the tip and tail. The width provides a good amount of surface area for larger riders as my size 13 foot fit on there with no problems. There are also 2.20 inches of three stage rocker and .5 inch of pre-kick concave. The deck weighs in at 6.5 pounds and also has a 12 inch long by 6.5 inch wide dual channel that is .15 inches deep. The overall shape of the Integrity wakeskate looks like the standard wakeskate shape among most skates on the market, but if you take a closer look at the deck, you will notice some things that set the Integrity skate apart from the rest. The urethane material on the top and bottom sheets of the skate gives it a very smooth overall appearance that is very pleasant to look at. The concave on the top sheet flows throughout the board with pre-kick concave at the tip in tail. The pre-kick is slight dip towards each tip that your feet rest nicely in while riding. Integrity built this skate to last. That was one of the main goals for finding alternative materials when designing the Integrity wakeskate. The strength of the board starts at the core and works its way out to the outer skins. The core is a hybrid closed cell machined foam. It is poured and heated under high pressure so the cells are tighter with less air mixture. This creates a higher density composite for added strength. The core is also CNC machine. The outer skins are a urethane base material that can be found on the bottoms of most snowboards and will help protect the board from letting water into the core and can also withstand the abuse of hitting rails.. Integrity didn’t spare any expense when building this skate as they were on a quest to use the best materials for the application. The construction of the skate also allows the rider to reshape the rails for a custom fit. Be sure to read the warranty information carefully if you decide to reshape your rails and are worried about your warranty. The Integrity wakeskate is currently available with Team "Lexicon Logo" graphic and a limited edition Tolstoy graphic. Integrity Wake will create a limited edition graphic as each edition sells out. Because the Integrity wakeskate was talked about so highly on the Wakeskating.com discussion board, by the time I received my own, it already had a reputation to live up to and I had very high expectations for it. That may have been a bit unfair, but knowing that the board was created by Erich Schmatlz, I had no doubt that it was going to be great. Once the skate arrived and I was able to take a closer look at it, I could tell that it was going to ride like a dream. As I mentioned before, this deck is very pleasant to look at. During my initial inspection, I was very impressed with the construction of the deck and the only concern I had was about the weight. It felt light to me, compared to wooden decks I was used to riding. When I took the Inegrity wakeskate out for the first test run, I immediately noticed the extra pop that I was able to generate on ollies. Before riding the Integrity wakeskate, I was already hearing from other riders about the pop, so I was looking for it and it surely didn’t take long to find it. In addition to the materials used to build the skate, I think that the pre-kicks in the concave contribute to the added height on ollies. The pre-kicks aren’t like the old school hooks that kept your feet on the board, they are just enough to give you a little extra advantage when popping the board are doing wake jumps. Another thing I was looking for was how the board was going to ride in the water. In my experience with other non-wood wakeskates, the ride felt entirely too much like a wakeboard as the board would ride a lot higher on the surface of the water. I was very pleased to learn that the Integrity wakeskate rides a lot like a wood skate in the water and not one bit like a wakeboard. In fact, I said that I was looking for this while testing the Integrity skate, but I didn’t even notice until I was on my way home. That proved to me that the ride was much like what I was used to (ie: wood wakeskates). Otherwise, I would have noticed it right from the start. As I expected, the first few times riding the Integrity wakeskate, I was overdoing every trick. The board felt light, but again, I have been used to riding heavier wooden skates. So I basically had to tone it down a notch or two and not put forth so much effort to perform tricks as I normally did. This took a set or two to get dialed, but it was not very painful at all. The board was not affected by the wind; I was just doing too much work when it was no longer necessary. After riding the deck a few times, my concerns about the weight was no loner an issue as I was very pleased with the feel of the board and how much less effort was needed to flip, spin and shuv the deck. On the wakes, the pop is very noticeable again. The board holds a steady edge cutting into the wake and all the way through the wake. The board feels strong on landings as I did not notice any flex. Other fiberglass wakeskates that I have ridden flexed so much, the nose would dig into the wake while riding up the wake on a wake jump. This was not the case with the Integrity wakeskate. Also, the pre-kick concave helps keep the board stable in the air on wake jumps. To really challenge the Integrity wakeskate, I took it across a few rails. These rails consisted of pvc and composite decking sliding surfaces. The Integrity wakeskate took both of the sliding surfaces on like a champ and slid very well across both of them. After several hits on the rails, there was hardly any evidence on the bottom of the skate that it ever touched a rail. I was not able to test the durability of the board on rails over a long period of time, in order to get this review done in a timely fashion, but after a day of hitting rails, the deck was still in great condition. Again, I suggest that you read the warranty carefully before hitting any rails if you are concerned about voiding the warranty. In conclusion, the Intergity wakeskate lived up to its preconceived reputation and then some. The deck passed every test I threw at it with flying colors. As I already mentioned, the only test I was not able to complete is how the board will hold up over time, which is one of the features that this deck is famous for. I feel confident that the board will last quite some time as it is very well constructed and is made out of the best materials available. At a retail price of $275.00 without fins and $295.00 with fins, Integrity is basically reiterating the fact that you get what you pay for. Although the Integrity wakeskate can be ridden by riders of any skill level, it surely isn’t the economical wakeskate that some may be looking for to learn how to ride or to keep in the boat to play on from time to time. It is, however, an excellent tool for those that are serious about wakeskating and are ready to take their riding to a new level. For more information about Integrity Wake or to purchase an Integrity Wakeskate, visit Integrity online at www.integrity-wake.com. If you have already purchased an Integrity wakeskate, be sure to see the User Mannual for instructions on applying the grip tape, reshaping the rails and warranty information.